Provides coverage of the major theories and technologies involved in the lifecycle of 3D video content delivery Presenting the technologies used in end–to–end 3D video communication systems, this reference covers 3D graphics and video coding, content creation and display, and communications and networking. It covers the full range of key areas from the fundamentals of 3D visual representation to the latest 3D video coding techniques, relevant communication infrastructure and networks to the 3D quality of experience. The book is structured to logically lead readers through the topic, starting with generic and fundamental information, continuing with a detailed section of different visualisation techniques before concluding with an extensive view of 3D mobile communication systems and trends. 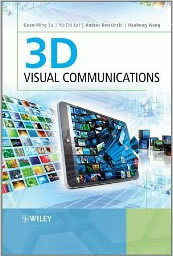 The authors give most focus to four important areas: 3D video coding and communications; 3D graphics/gaming and mobile communications; end–to–end 3D ecosystem (including 3D display, 3D player, networking facility and 3D quality issues), and future communications and networks advances for emerging 3D experience. Presents the theory and key concepts behind the latest 3D visual coding framework, standards, and corresponding quality assessment Provides fundamental material which forms the basis for future research on enhancing the performance of 3D visual communications over current and future wireless networks Covers important topics including: 3D video coding and communications; 3D graphics/gaming and mobile communications; end–to–end 3D ecosystem; and future communications and networks advances for emerging 3D experience Essential reading for engineers involved in the research, design and development of 3D visual coding and 3D visual transmission systems and technologies, as well as academic and industrial researchers.